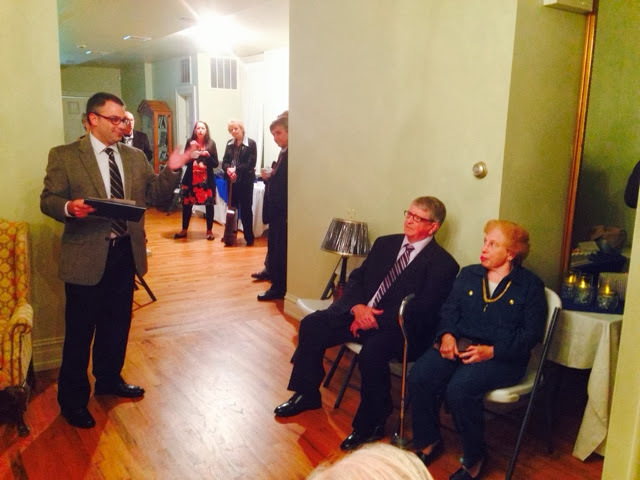 Bierly's retirement from Elizabethtown Borough Council after 40 years. Tomorrow night, a page in Elizabethtown’s history will come to a close. Borough Councilman Meade Bierly will retire after 40 years. That is, at a minimum, 960 regular Borough Council meetings over the years, a number that doesn’t take into account special meetings and other boards, authorities and organizations on which Meade has served in his capacity as an elected official. Nor does it take into account the hours spent during and preparing for the meetings. In today’s world, it is unheard of for people to stay in jobs for more than a few years, let alone deciding to hold elected office. Bierly was appointed to Borough Council in January 1973 to fill an unexpired term and was elected to a full four-year term in 1974. In the program for a reception held his honor last month, it says that he credits his dad, Meade S. Bierly, and the late Vincent O'Connor, a former mayor and councilman, for instilling a philosophy of giving back to the community. At the reception, Bierly said public service is a way to give back "for the space you take up." Bierly has been part of the hiring process for every current borough employee. In 1976, he was instrumental in the partnership with the Elizabethtown Area School District that led to the formation of Greater Elizabethtown Area Recreation & Community Services (GEARS) and the subsequent creation of the Poplar Street Park and the Fun Fort. He has overseen major projects such as the construction of the borough offices and police department on Hanover Street in 1980 and expansion of the wastewater treatment plant in 1978 and 2002. Most recently, his insight was helpful in the construction of Bainbridge Street at the Dove Chocolate plant and with the renovations of the Amtrak station. As might be expected, Bierly didn't always agree with his fellow councilmen, sometimes vociferously disagreeing. But he never encountered anyone on council who wasn't doing what he or she thought was in the best interest of Elizabethtown. Back in the late 1990s, I had the pleasure of covering Borough Council as the editor of the former Elizabethtown Chronicle. I could tell then that Meade was someone who cared deeply for the borough, and I am pleased that I have been able to work with him on the other side of the table. I wholeheartedly agree with him that public service is one of the best ways to give back to your community. Speaking as a former newspaper editor and reporter, and now as a member of Borough Council, I have one question to ask of Meade: What are you going to do with your Thursday nights now? Enjoy your retirement!